With Washington facing a historic drought, the city of Spokane is asking residents to cut back on their use of water. The city gets its water from the Spokane Valley-Rathdrum Prairie aquifer, and during the heatwave in June it was pumped at record level. 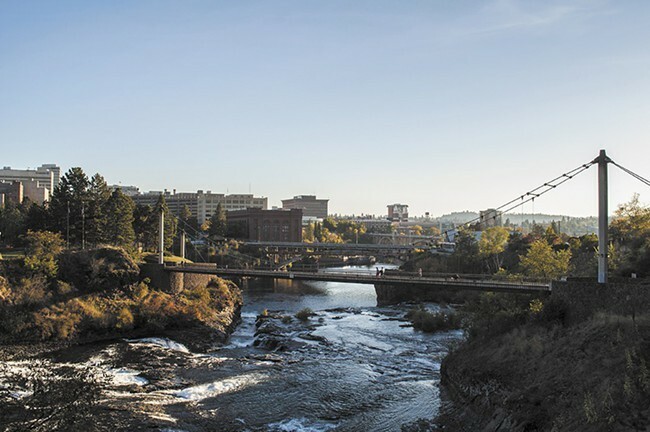 The Spokane River relies on water flowing from the aquifer. And because of low snow packs and all this pumping, it’s reached historic lows. The typical Spokanite uses 20 cubic units of water annually, with every unit being the equivalent to 748 gallons of water, according to city spokesperson Marlene Feist, which pencils out to about 15,000 gallons of water. The Inlander decided to look into who are the heaviest residential and institutional users of water in Spokane. The names of residential users are shielded from disclosure under the state’s public records, but the top residential user guzzled 3,110 cubic units of water, or 2,326,280 gallons of water. Institutions are even thirstier, needing water for lawns, landscaping, employees, patients, saunas and more. “Each of these institutions needs to take action to review and reduce its water use, and recognize that they have a civic leadership duty in doing so,” says Osborn. Spokane’s municipal government is asking residents to “Slow the Flow” by not watering lawns during heat of the day, not running the hose needlessly and even undergoing an irrigation audit. Spokane’s municipal government is also its own largest consumer of water. City Spokesperson Feist says the city has multiple water-use accounts. But the one that topped all others was for the city’s wastewater treatment plant, which treats and returns cleaned water to the Spokane River. Cleaning that water, says Feist, requires water. Liz DeRuyter, the hospital’s spokesperson, notes in an email that the 2-million-square-foot campus is also like a “small city” within a city that provides services for thousands of patients and visitors each day, as well as 3,000 employees. The company, which describes itself as “one of the world’s largest suppliers of technologically advanced aerospace and defense products,” didn’t respond to a call for comment. Spokane Parks and Recreation Department operates four water-guzzling golf courses, the thirstiest of which is the Qualchan Golf Course. Monique Cotton, department spokesperson, writes in an email that the city is looking into improving irrigation systems and addressing leakage in water distribution systems. “We certainly recognize there is room for research and improvement to our water consumption and use techniques and are taking the steps necessary to make these improvements,” she writes in an email. “Our Water Department and the Parks Department are teaming up to identify projects — ones that we can do immediately and others that will take a little longer but have a greater impact. Hollister-Stier Labs, a maker of pharmaceuticals, didn’t respond to a request for comment. San Souci West is a gated community that bills itself as a “living modular home park designed for the 55 [and] over crowd.” Duke Pappenheim, manager of San Souci, says that some of the amenities that come with living in the park use a lot of water, such as the sauna, which uses 1,500 gallons of water a month. There’s also the swimming pool, which is filled with 40,000 gallons of water a year. But the biggest use of water, he says, is probably watering lawns. The company appears to own real estate. It did not return a call seeking comment. Carolyn Casey, the public information officer for the college, notes in an email that Spokane Falls Community College is 127 acres, much of which is covered in grass and requires routine landscaping and watering.